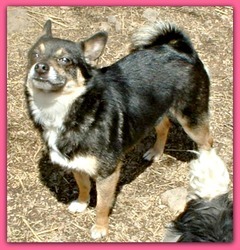 Sandy is so cute we have decided to give her a new breed name of "Pomachi". Sandy is in rescue because the family who owned her had to many dogs and had to give her up. She is between one and two years old. Sandy can actually do some tricks. Riverhill feels that she would do best in a home with adults and older children. Sandy would probably not do well with infants or smaller children. Her adoption fee is $85.00. This includes her spay, routine vaccinations, including Rabies, heartworm test, and major worming. If you want or know someone would like to give Sandy a home please click here. We think Sandy is a real cutie and hope she can find her home. I hope Sandy finds her forever home soon. After seeing my entry. Riverhill commented on Facebook. Sonja said, "She is so much cuter in person. She takes terrible pictures. She is smaller in real life too." We are always optimistic that a dog we post finds a home. We really hope Sandy does. This one is adorable. Awww, she's a cutie! I'm sorry to hear about her having to be given up, but hopefully it will mean an even brighter future. Will share! Thank you, I did not know that was a rare color for her mix.